Arthur Dahl gave the opening keynote on "The future of business in a world with a changing climate" (http://iefworld.org/ddahl16c). He highlighted the requirement of the Paris Agreement for a rapid transition to a low carbon society and the challenges this represents for a country like Kuwait with a economy built on oil, and suggesting some of the options for a more sustainable future. 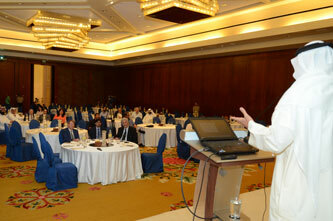 The following workshop allowed participants to discuss some of the positive directions that Kuwait could take. The second speaker was Dr. Hamad Al-Hasawi, President of the Kuwait Banking Association, on "Strategic projects in Kuwait: opportunities and challenges". The second conference session began with conference organizer and ebbf member Bayan Salmanpour speaking on "Coexistence, business and the environment, do they mix? ", followed by Arthur's second talk on "The UN 2030 Agenda and Sustainable Development Goals: challenges and opportunities for business" (http://iefworld.org/ddahl16d). The last conference keynote was by Dr. Wendi Momen OBE on "Why bother with business ethics? The ebbf view" in which she discussed a number of passages from the Qur'an about ethics in business transactions. 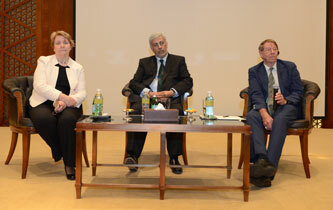 The conference concluded with a panel discussion responding to questions from the audience. Discussion continued afterwards around an extensive buffet lunch. For a photo album on the conference, see http://yabaha.net/dahl/travel/t2016/Kuwait/Kuwait.html. See also the report by Wendi Momen in the Wilmette Institute newsletter at http://wilmetteinstitute.org/vision-gulf-business-conference-a-new-ebbf….